With what seemed to be one of the wettest days in history, a dose of fiery high energy live music was what I longed for. Thankfully, having seen both Red Rum Club and Kahuna only a few months ago at the same venue, that was certainly what I expected of the night ahead. After a short walk along the seafront to the Surf Café nestled between Tynemouth and Cullercoats we arrived just after doors opened to find Be Quiet Shout Loud still in the midst of their sound check. Having heard so much about this incredible Teesside disco-pop band, seeing these guys myself for the first time certainly only added to my already immense excitement levels. By the time we grabbed a drink from the bar the inviting tones of the opening act Foxriver got things kicking off in front of a crowd that was quickly filling the scarce space. 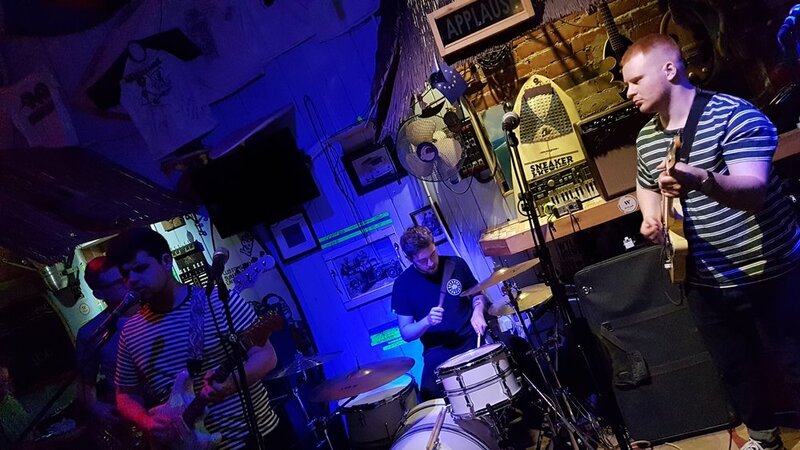 The Newcastle four piece are relatively new to the scene, first making an appearance earlier in the year and currently working on their debut EP. With their modern bluesy-rock sound and impressively soulful vocals, Foxriver really laid down a strong performance as they switched between upbeat and mellow numbers with superb technical skills that promise a great foundation for the young band to build on. As more and more music fans assembled to add to the intimate feel of the venue I headed to the front to make sure I would not miss any of the next band’s sights and sounds. In their sparkly band attire, and accompanied by a loyal mascot in the form of an adorable soft-toy cat called Daryl, Be Quiet, Shout Loud wasted no time in living up to their name. Infectious top-volume disco melodies immediately get the party mode into full swing as the band's electrifying energy transfixed everyone around them. The Middlesbrough five-piece have clearly built a loyal following across the region, with a number of fans donning guitarist Jamie’s trademark dark eye masks and sporting an eagerness to join in with the choruses whenever possible. With their brand new EP 'Another Commotion' just released, their set was a great mix of hooking new tunes like 'No Hope' and 'Louisiana' which sounded as infectious as their previous pop-tastic single 'Superheroes'. As frontman Chris begins his first crowd-mingles and speaker-climbs of the night, BQSL really make a deep mark on the night and my mind as a band I most certainly will venture out to see again. After happy revellers return from a short break of much needed fresh air outside, the high-tempo ska-beats of Newcastle based five-piece Kahuna immediately threw us right back into the fray with a flurry of frenzied foot-stompers. Their fantastic blend of the classic ska and brass sound mashed-up with attitude packed punk-rock is like an overwhelming adrenaline rush that you never want to end. Even for those who don’t know the words, the melodies had everyone joining in as they grabbed the person next to them for that intense feeling of togetherness. This was especially apparent during their incredible cover of A-ha’s 'Take On Me', swiftly followed by the band's superb original debut track “Throw” which was released earlier in the year. I simply cannot speak highly enough of this band which has to be experienced live to understand their full magnitude. By now the Surf Café is equal in space to a tin of sardines, with gig-goers all crammed in and nicely line up side by side. The night is a sell out and for good reason. Perhaps a bigger venue should have been chosen for a line-up of this caliber, but then nothing compares to being so up and close with a band that is about to unleash a potent live show like only Red Rum Club can. The Liverpool based five-piece have grown in reputation due to both their on stage energy and their distinctive sound that infuses fiery anthem worthy indie rock melodies with twists of far-flung flavours, most prevalent in the use of the singular trumpet. As charismatic and exuberant frontman Fran leaps onto the stage to join his band, huge cheers erupt as he unashamedly douses himself and the snare drum with an almost full bottle of water that makes being up-close at this point a rather showery experience – typical theatricality that sets the benchmark for the show ahead. With the first exhilarating tune under their belt to get the crowd warmed up, their hit 'Calexico' kicks in with its haunting western-style intro that sends your spine tingling. The hypnosis was then broken when the hip-shake-inducing groove takes hold and the focus returns to the fascinating frontman whose vocals are as alluring as his stage presence. With not a single lackluster tune in sight, the energy in the room was palpable and there was a real sense of pride in being able to witness a band with so much crowd-pleasing potential up close, and when their debut album is announced as being due for release in January I make a strong mental note to get a pre-order in as soon as possible after the show. Album track 'Remedy' received a fantastic reception for a song unfamiliar to our ears and was swiftly followed by the much more familiar tones of 'Friend of a Friend' that had the whole room chime the words back in unison to this incredibly craftily written tune. Although it initially falters,ever undefeated he climbs the heights of the usually unoccupied balcony with a fan in tow while the assembled crowd below carries on singing the words in utter devotion. A triumphant finale for a show by a band at such an early stage of their hugely promising career. I most certainly think this may have been the last time we see these lads play a venue of such minuscule size – and we simply can’t wait to see them scale even bigger heights! Be sure to get your hands on Red Rum Club’s debut album 'Matador' when its out on January 10th and of course at every possible chance see this band live for the full force experience.